You can just take a few steps with each, before a cut in, but these people you are at least to ask to dance. At a public gathering, or at a dance, where you had to pay to attend, you can omit dancing with anyone outside of your own party. Ask the women at your table to your left and right to dance. You may dance with all the women who are assigned to your table. And you could dance with anyone in your own party. When asking a woman to dance, smile. Do an inquiring gesture and say, "May I have this dance?" or "Dance?" You may do a small bow when asking for a dance. Allow a woman, who has agreed to dance with you, to precede you on and off the dance floor. Walk to her left. You can walk in front of her across the dance floor. You may take just a few steps with her, before or after a cut in. You could cut in on a woman's partner by a mere touch on his shoulder and saying, "Cut, please," or "May I?" A request to cut may not correctly be refused. You are to avoid cutting back until another man cuts in, or the music stops and starts again. You can exchange partners with another man at any time by all parties' mutual consent. Avoid doing a cut in while in another country. As a man, you, or the woman with you, may suggest leaving the floor in the middle of a dance by saying, "This floor is too crowded," "This song is too slow," or “too fast," or by asking, "Would you like a drink?" Failing all else, you may leave the dance floor after making a discreet signal to another man to cut in. When the music stops, or when you stop dancing, take the woman dancing with you to her new partner, to her table, or back to her group of friends. Do this directly or by implication. Remember to dance the last dance with the woman you took to the dance, unless given approval to do otherwise. Know, or learn, how to dance. Move one foot to the left or right counting "One." Move the opposite foot to join the first one counting, "Two." Move the number two-foot in the opposite direction, "One, Two." Continue this process. Later as your feet come together, snap your fingers (Move, snap.) Put on some music. Time your movements so that on the snap your feet come together on the downbeat of the music. When you can do this, all else about dancing someone will gladly teach you. Take a class. Ultimately - you are to learn to dance. You may have to practice extremely hard for long periods, but be a willing soul, and learn to dance. Dance in the custom of your planned company. (Avoid seeming to be having a better time than everyone else, or endangering others while dancing.) Know that the question will be asked, “Can the man dance?" The reply is to be a resounding, "Yes." The key to success: play the game, eat the meal, and dance the dance – in an acceptable style. 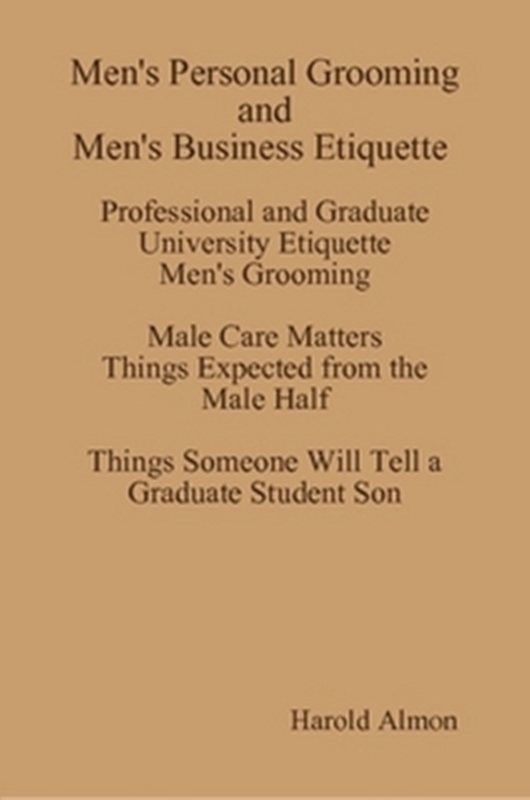 Link “Manners to Etiquette” – Outclass the Competition. Men are to look at their teeth through a mirror from six inches away. This is a test. Clench your teeth together and smile. What you see is what other people get to look at all the time. Maintain your teeth. Teeth are to be clean, natural, and non-ornamented (except for braces.) Teeth can be whitened by baked bonding, (baking soda,) bleaching, bonding, laser, or by toothpaste. Avoid over whitening. The phrase you want someone to say is, "I would not have known it, if you had not told me." You may get braces for crooked and/or for bucked teeth. You could get a retainer to bring your teeth that gap back together. When you want to become known by and for your irregular teeth, let them be. Make this a conscious decision. For the most part, get caps for teeth that are broken, and false teeth to replace teeth that are missing. Avoid placing gold in your mouth that you can see, unless you really are an independent contractor. It can be too much night style for day promotions. At least once a year have your teeth professionally cleaned and get a fluoride treatment. Mouth care is the process that lets you show off your pearly (near) whites. The goal is to have clean teeth that gleam. (Just before taking any picture, you can rub your teeth lightly with petroleum jelly.) Now work your smile. Brush your teeth. It is to be done at least twice a day, for two minutes each time. One of these times is to be before you go to bed. Then remember the deal, brush after each meal. At minimum, never miss an opportunity to brush your teeth prior to going outside, look at them in a mirror and check; you can meet your next most important contact, just outside your front door. You can brush your teeth with your finger and water, the parts that are clean will squeak. You may run your tongue over your teeth, front and back, the parts that do not feel squeaky clean, that is what you get a toothbrush to brush. Take your toothbrush and apply to it toothpaste (the size of a pea,) baking soda, hydrogen peroxide or apply salt. Let it sit for a minute in your mouth. Then brush your upper teeth downward, and your lower teeth upward. Brush back and forth over the top of each molar. Brush the front, back, and sides of each of your teeth, and behind each of the last molars. (You can use a circular motion, or circulating toothbrush.) Brush your tongue, and/or the roof of your mouth. You can buy a plastic device for this purpose. Rinse your mouth out with water. You can put water on your toothbrush and brush your teeth while you are rinsing your mouth. This is win-win: longer time brushing cleaner toothbrush in the end. You may use mouthwash without alcohol in it. Rinse your toothbrush. Gently whack it against the inside of the sink. Place it in the holder, tray, or drawer intended to store it. Floss your teeth? - “Only the ones you want to keep.” It can be done prior to brushing them. It may be done at minimum once a day. Use a sixteen to eighteen inch length of floss to accomplish this action. Wrap an end of the floss around each of your index fingers and leave about a three-inch length of floss between each finger. Hold the floss with the thumbs, pull it taunt and work it up, down, and around, gently between each tooth. You may use a commercial floss holder to hold your floss while you are doing your teeth. Then just rinse out your mouth and go, or you may elect to re-brush. Clean your toothbrush and that cup. Each week pour hydrogen peroxide into the cap of the bottle in which it came. Pour a little from the cap onto the bristles of your brush. (Listen to the fizzle.) Then brush your teeth, or rub the bristles firmly. The residue toothpaste will come free. Repeat the process. Rinse your toothbrush. Place it on your tray. Replace your toothbrush. Do this every two months. O.K., now pour some peroxide into that cup. Listen, and then clean it. Check your mouth for halitosis; do this often. Blow your breath against the palm of your hand, and smell it. Remember, bad breath is better than no breath at all, but it is so - just barely. Avoid yuck mouth. Correct any condition which causes you to have bad breath. It is second in turn-offs only to bad body odor. Combat bad breath by taking a breath mint. You can do this by gargling with a cup of warm water and salt for about thirty seconds. Gargling may be done with hydrogen peroxide. You could scent your breath with cinnamon or with a cinnamon flavored gum. Gum is to be removed as soon as bad breath is mitigated. Bad breath might be combated by seeing a doctor for treatment for any gum disease, gastro-esophageal, or intestinal problem. Get your teeth checked by a Dentist at least once a year. You can die from bad teeth. Because of them, you may be denied access, acceptance, and advancement. Make the reverse happen. In the United States of America, at a minimum, a male is take a shower or a bath at least once each day, in the morning, at midday, or at night. The day a shower is missed entirely, you will meet the most important people in your life. This will make a favorable impression, less than one percent of the time. Outside the USA, take a shower at least once each week, in between sponge yourself, and use a moisturizer. In a private home, lay a large towel on the floor next to the shower and atop a carpet or bathmat. Lay a hand towel close by the shower. Place a face cloth or an exfoliating wash cloth in the tub, or take one with you into the shower. At a public shower, you can hang your bath towel on a towel holder. You may omit from using a hand towel, and the use of a face cloth is optional. Rinse or dunk yourself under water until you are totally wet. Turn the water off. Apply soap onto a wet face cloth, or onto your body, and rub it over each part. Take extra care to clean behind your ears, in the outer ear, around your neck, behind any foreskin present, and between your toes. Then rinse and stop. You could repeat the process with a scented or better grade of soap. Dry yourself as much as possible with the wrung face cloth, or dry yourself with just one corner of a towel. Pat your body with the rest of the towel. Dry each foot, and between each toe, one at a time. Place one foot near the edge of the shower. Dry it. Place it on the dry floor. Repeat the process. Ensure each area mentioned is thoroughly dried. To fully dry yourself, you can use a paper towel. Take a shower or bath every day except when you have a temperature of one hundred and four degrees. At a temperature of one hundred and two degrees, contact your doctor, get approval, and risk it. Get more than "Air" wet, and get more than your body dry. You need to do this. Learn to take a bath (even when you are not hurt.) A bath is used to scrub your spirits. Romans used to take up to eight baths a day. Light candles, where it is allowed. You may even let them float. Run a mixture of hot and cold water together. Add bath granules, oils, cologne, Epsom salt, or bath salt to the water. Step in. Sit down. Allow five to eight minutes of soaking before even beginning to suds up. Use a liquid soap to suds up with, or use a soap of preference. You can wet and suds up an exfoliating wash cloth and use it to take off dead skin. Suds up. Lie down; relax. When finished with your bath, let the water drain. You may now take a shower to rinse off, and to, "Man back up. "While still in the tub, use a wrung cloth to dry off. You may dry off with one corner of your bath towel. Pat yourself dry with the rest of it. Dry each foot; place one foot on the tub rim. Dry it. Place it on the floor. Take the other foot and repeat the process. Clean the tub. Use your rinsed face cloth or a paper towel, cold water, and the soap you bathed with, to remove any tub ring or basin leavings. The key is using cold water and soap. You can use a bathroom cleaning sponge for this that at least weekly gets washed with laundry. This process can be used to wipe down a shower. You may use a daily spray cleaner. In a public shower, this could be done by someone else, but it is to be done. When you are in a rush you can wipe the tub dry with a little toilet tissue. Once you see the dirt, you may want to add some cold water and soap and do it again. Take your bath towel out the bathing area. You can wrap it around your waist, and continue your personal care process. "Seek knowledge. Go to college. Stay there until you are through. If they can make penicillin out of mold, that’s true," they will make a passport for you to be you. A’s are pretty to see. C’s equal a degree. A degree is a social passport. It can allow you entry into new country. Your transcript may be your ticket. It could determine where you get to sit. 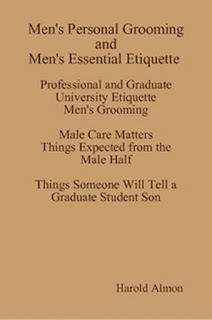 Add a course in etiquette; it might be a key to access: how you fit, what you get to see, and how long you get to stay. Education without sophistication leads to isolation. There is a social requirement to academic refinement. Get your degree. It is required for long-term stability in an upwardly mobile society. It provides a socially acceptable reason to hang out away from home. It can have little to do with the job that you do. Know your education level. For the rest of your life someone will pay you by it and ask it of you. Have a major. It can be that your major will support you. It may just be your passport. Your major will allow someone to give you credit, or worse to give you a loan. It can be used to let you take a test for a job, and/or to pay you more for the time you trade for money. “To get a good job, get a good education, (in fields which are hiring. )” Get the certification. Few people will ask you about your GPA or your degree, after you do. You may have many degrees, as long as one is not a doctorate. Avoid getting a PhD unless your major is a “Hard” science, (here a Masters is the Bobbie prize,) or unless you are willing to be self-employed, to teach, and/or to live off grants or insurance money, and then only if you are lucky. When you get older, go back and get it. It is a nice passport. It is nice to have someone call you doctor. 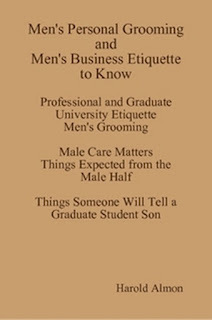 Pick up a class in etiquette. A doctorate without etiquette is an awkward fit, is inadequate. Even you would not want to be around you - if you knew. And now you do. No fear. Add a course (more than a one day class) in etiquette. Poise is going to look good on you. In business, you will learn that a degree is only a license to allow someone to let you do what you were already good enough to do, pay you for it, promote you, and to maintain limited liability. An advanced degree is a license to allow you to be a full director in your field, even when the two are non-related. Even from this you will retire. Have a minor. It is your minor that will give you your freedom. Place in it your passion, your work, and your research. Remember what it was that was important to you, shared with you, and taught to you. While you are busy making money, practice doing the thing(s) that will make you free. If and when your minor gets to be your major you have captured the brass ring. Follow the work of your minor. Then teach it. Those who can teach do. It is an obligation. Those who cannot teach, teach teachers. What does it matter as long as the word gets out? When you do get to the table, it will be as an equal. You can not inherit or bequeath a degree. You can get one or to the same place and do the same thing with a good work summary in a field you have pioneered or explored intently and extensively. It takes a lot longer. Get your degree. You can start with CLEP tests, and with life experience credits. How long can you stay dumb or without one? Until you learn and pass tests. Then who can take knowledge (or your degree) from you? Remember this about education, it is a social passport, even when you are just going home. Etiquette is the rules for the role: what you need to get and how to dress for the trip. Men moisturize your skin, after a shower or a bath. When moisturizing your face take care to do your eye wells, your lips, and do behind your ears. Let it dry in. This is why some people have few wrinkles, and soft skin. Moisturizer is wax for the skin. Use a lotion with cocoa butter or shea butter over one with aloe. You can use a baby lotion, (remember.) You may use a lotion for your skin, and oil for your feet. When caught short you could use a petroleum jelly over having clean, dry, and exposed skin. A moisturizer is to be applied to your body from the head down. It can reduce body odor when dark skin and hair is exposed to heat. If you do not do this, when it gets hot, your body will oil itself (and it will not smell half as good.) Do it and you will have softer skin, fewer wrinkles, and smell better. You might then use a sunless tanning cream that contains a SPF 15 or more sun block, when you are to have an extended stay outside. Avoid placing it in the wells of your eyes. My mother use to say, “Come here baby. Let momma put something on ya.” And I got moisturized, face, eye wells, and behind the ears. Then she’d say, “Pouch out baby, pouch out.” And with the same lotion she moisturized my lips until the texture changed to soft. Lo these many years I have smooth skin, soft lips, and few wrinkles, and can beat most young at the squint test. All skin cracks; what saves skin is not the genes it’s the Jergens. ® You can man up and use the kind that is unscented. Still believe its genes? Give the Jergens ® back. Note: when you are going to exercise, wash the Jergens ® from the wells of your eyes. Avoid pushing through it. Change lotion every month. Something from the outside (or dirty hands) can contaminate the eye. You can wash the bottle and your skin with distilled vinegar or 91%alcohol. You may see a doctor if irritation persists. (This happened one time in over many years of doing this. In the event of an onset of acne, you can still preserve your eye wells, ears, and lips. Ask a professional about another moisturizer that can protect your face. You can try 91% alcohol on shiny or oily skin in the interim. Not sure if it will stop the shine. Oh yes, the test. Look into a mirror. Squint one eye; see the wrinkles, at the sides of your eyes, and the skin; the fewer wrinkles the more you win. You only get one (skin.) You would not wash your car, dry it, and set it unprotected in the sun. Moisturizer takes the place of wax on the face. It may go a long way in keeping you looking like new. This is harder to do after wrinkles set in or after oxidation. Check your wrinkles against those of a young friend. The old ones do not even tell about the test, and do not challenge them. Skin is to be cared for. Apply a water-based moisturizer to your skin to seal and protect your face after it has been exposed to a sharp blade. Use a moisturizer which has no scent, or which contains a scent which is compatible with your after shave. You may apply an after shave at this time. Allow it to dry, and then apply a water-based moisturizer to your face. Do your whole face. It is your first defense against wrinkles. It can protect and make skin less prone to irritation: Pseudo folliculitus barbae: an inflammation of hair follicles. Feel your facial skin. Say, " Mmmm." Maintain your nails. Take the nail test; hold each nail against a mirror, one at a time. Look through the mirror at each cuticle, each nail underline, and at each nail tip. What you see is what other people get to look at all the time. Get your nails chlorine clean, unless you are allergic to it; soak your nails in bleach for four to five minutes. It will become warm and start to foam. Your finger nail will begin to feel slimy, (no other way to say it.) Now rinse them with cold water until they feel like tile that was just cleaned. Next buff each nail with a terry cloth towel; take a look and enjoy the shine. Take the mirror test again, now flash: fling your nails forward at that same mirror. Damn, that shine looks good on you. Avoid doing this often, unless there is a need to show off. Be easy on ’em. Avoid any shine provided by nail polish. Be easy on yourself. It has been said to whiten your nail tips, soak them in distilled vinegar, before or after buffing. Learn the art of doing your nails. Take your thumb and/or index finger and pull the topsides of each of your nails down. What you see is what affects your shadow line. There is to be a u-shaped line around each cuticle that is smooth and catches a shadow. This may take some filing…. File your fingernails. Use an emery board when you can. This is to be done when nails are dry. Fold your fingers toward you. File away any overgrowth exposed on your nail sides. File sides in to meet the natural line of the cuticle beds. Remove and smooth rough skin along the sides of the nails. Look for the C curve, tomorrow. Next, you can use the finishing side of your emery board to file down any imperfections, stains, and ridges on each nail. Then, place the shaping side of an emery board under the nail edge at a slant. Start one-eighth inch in and file each nail in from side to center down until each is even with the tips of your fingers. Each nail is to compliment the shape of each well maintained cuticle. Ensure each nail is the same length or in visual sync with each other. Then file behind the tip of each nail so that a clear separation between skin and nail is evident. Wet your nails. File each nail again, if any back nail membrane becomes evident, file it off. You may shape the under skin, to duplicate the nail tip. Use a nail file, or a cuticle cutter tip. Place the item under the nail and gently move it (no lower than one eighth inch) down and to the left or right. Outline the shape of the under skin to mirror the tip of the nail. You could take a corner of a wet terry cloth and rub your cuticles back, down, and to the right and left to get all but the most difficult dead skin off each of them. This will create a shadow line around the bed of each nail. (Ensure your cuticles are moistened to affect this process.) Should your cuticle tear, nip it with a cuticle cutter. This is the only real function for this tool. You may allow it to dry overnight, and to be rubbed away tomorrow. You can push back your cuticles. You may do this after a bath, or a shower. You may just wet your nails with cold water. Then use a tip of an emery board to push your cuticle tips back off your nail surface. The first time you lift your cuticles back they may be sensitive: hurt for a day or two. (Moisturize them.) Maintaining your cuticles takes a little practice: rub, moisturize, oil, file, and/or at last resort, nip them. Once tried, it only takes a little time for correction later. You might omit doing this or have it done by a professional, who promises only to nip at but not cut them. Moisturize your cuticles daily. Lotion them over oiling them. You can apply Hoofmaker cream®, Cornhuskers Lotion®), or a cuticle care cream, to each nail bed with your thumbs. Each substance will assist in the care of your nails, and help to identify nail overgrowth that was overlooked; corrections can be made now or the next time. It may be done with a lotion to allow a groomed shadow line to “Pop.” Go ahead a flash. Omit adding a moisturizer to your hands at times when "clean hands only" are a condition of your employment. Wet and rub your cuticles and nails with a wet terry cloth over filing them. The process is called “Rolling.” File them over cutting them. Cut only the part of a nail or cuticle that is torn. Make repairs to your nails. When two or more nails are chipped or broken on the same hand, all nails on that hand are to be filed to the length of the shortest nail. You can add a gelatin product in your diet. Eat vegetables. Own a nail clipper if only for the file. When cleaning behind your nails in a rush it beats a brush. A man may rarely take care of his nails the way he could. He could be talked into letting someone else do it for him. Get a manicure. Avoid letting your cuticles be cut, or your nails says bad things about you. Be alerted that white-spots on your fingernails may be a sign that you have a protein processing deficiency: too much dairy, or that you have bruised a nail. Do not worry. A sign of a vitamin deficiency could be ridges on your fingernails. So could the peeling of skin at the sides of your nails. You might take a RDA minimum multiple-vitamin, say every other day, until the peeling goes away. Buff your nails. This can be done by using a piece of terry cloth, or with a rubber buffer. Avoid adding polish to this shine. O.K, now look at the last pictures that includes your nails. Know that each nail will look that much better the next time. Words We Use. The words we use tell more about where we have come from, and how far we are from anywhere we want to be, than any genealogy. We are judged by our word selection, and by how we answer questions. What do you call a hired car and driver? A taxi and a taxi driver, a limo and a limo driver, a limousine and a chauffeur, or a car and driver? What color should a limousine be? White or Black? Which is more correct, a couch, a davenport, or a sofa? Draperies or curtains? What should you get dentures or false teeth? Is it a Tux, a Tuxedo, a Dinner Jacket, Black tie, or evening clothing? Is full evening clothing a three-piece suit, a Dress Set, or White tie and Decorations? What is to be used, a watch, clock, or timepiece? Stationery, letterhead, or writing paper? Which do people use the Rest room, Lavatory, Bathroom, or Toilet? Which do you aspire to be, wealthy, affluent, or rich? What do you write communiqués, messages, or notes? Is, “the kind invitation,” part of an acceptance, and “the very kind invitation,” part of regret, no, or yes? Is it a gratuity or a tip? Did you attend School, College, or University? Will you pass away, or die? (You will surely die.) Who will bury you, a funeral director, or an undertaker? We are judged by our word intonation and by our pronunciation. Is the word often, (off-tin) or (of’ en)? And we are judged based on how we vacation. Will you be weekending, or summering every year, at the same place? Where are you from America, or the United States? What is the “right” thing? It can include stepping up, resignation, suicide, (tell the person insisting that it be done that it is not happening,) or temporary insanity? (For which there is rehabilitation.) The more correct answers for each of these are to the right. Avoid the word "Actually." It might be taken as condescending, over correcting, and trite. Learn the power of the word can. It may be placed before or after the words, When, What, Where, and How, and demonstrate deference to superiors. 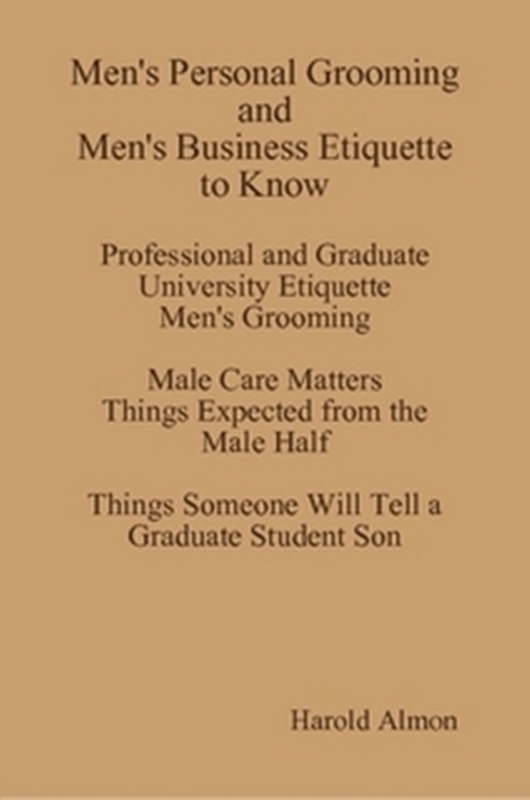 It can be omitted and indicate conversation between peers, or display a license taken. Know that we are judged on our ability to relay information with humor, and to be funny. Learn word usage from a sociologist. Study words we use. They tell who we are. The most useful could be, “Excuse me,” “Bless you,” and “Thank you.” There are more of these. Be at ease. We are judged by the sports we play. Are the sports you participate in free or expensive, convenient or inconvenient, played locally or at a distance? As you make your ascension games will be played at a distance, be more expensive, and become more inconvenient – if you are lucky. Expend the money. Learn about sports. A sport is just a game that is played in the extreme. On the performance level, learn to like at least one. Stay informed about at least one team that plays it. Remembering statistics of each player could improve your overall memory. Share both with someone. Pick one to play. On the operational level the key to being approved is being asked to join in, knowing the rules, and then playing a sport. Sports help teach proficiency, rules, and how to follow them, allegiance, time management, discipline, manners, how to fit in, and how to compartmentalize data retrieval. These skills are essential in business. You can get a comparable skill set learning to play music, but fewer opportunities at dueling banjos. Learn the rules to gladiator games. These are sports played in teams with large balls and complex strategies. Each is directed by a coach. You may avoid learning any extreme sport, like jumping off a perfectly good mountain, or out of a functioning airplane.